Horn Trio (2004) for horn, violin, and piano was commissioned by Harrison Nelson for Composers Concordance of New York City and is dedicated to Joseph Pehrson and Patrick Hardish, directors of Composers Concordance. The work was premiered by Lynn Bechtold, violin, Barbara Oldham, horn, and Paul Hoffman, piano. The whole piece is based on a shared set of musical material, founded upon the interval of a perfect fifth. The work is a celebratory contemplation of the relationship between this world and the cosmos that contains it—not a pretentious “summing up” of this relationship, but rather an awe-filled contemplation. The opening movement, Windsong, begins with an irregular rhythmic ringing figure in the violin—supporting a melody in the horn. Both of these (rhythmic gesture and melody) are the principal material of the movement. The ringing tapestry continues to build towards the conclusion. The second movement, Interlude I: Forest Bells, is hushed. A brief chorale in the middle interrupts the sustained ringing. The third movement, Dream of Grass and Water, is slow and spare, with a ceremonial atmosphere. The fourth movement, Interlude II: Harbor Bells, is similar to the first interlude, though its material hints at the fifth movement. The fifth movement, Starsong, is celebratory. The principal theme is first introduced as an incantation by the violin and horn, over a piano ostinato. The movement builds a bit in texture until a brief slow section interrupts (recalling material from the previous movements). Finally, everyone is caught up again in the swell (with violin and horn singing ecstatically) and the movement presses on to its conclusion with a blaze of starlight. The last movement, Small Bear, Large Telescope, returns us to earth. 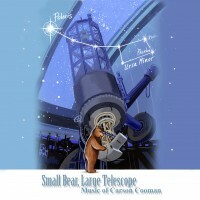 It is inspired by a drawing of a small bear gazing into a huge telescope—awed by the cosmic vision he sees. A quiet, tolling pattern in the piano is the basis for simple melodic development—recalling material from the previous movements before tolling into eternity.